Giving students opportunities to self-direct their learning within the classroom is a tremendous way to enhance student engagement and confidence. Most of our high school math classes use an approach that allows students some choice in how they learn. Students can work individually using an online lesson prepared by Greenwood teachers or in small groups. Some of our math classes are co-taught, which means there are two teachers in the room. This approach allows students to get direct instruction from one teacher, while the other teacher facilitates group learning. This approach is effective, as students use class time efficiently and learn in a way that meets their individual needs. According to our students, having input into how you learn makes learning engaging. Our alumni tell us that this approach equips them with the high level of independence required to succeed in postsecondary studies. Our new rooftop terrace reflects Greenwood’s commitment to the outdoors while creating an urban oasis for our community. At lunchtime on the first truly hot day of spring, the terrace is filled with students enjoying the May sunshine. Most are eating lunch, while some are chatting quietly; later in the day, students on spares will head up to the fourth floor to study or read. The rooftop terrace is an ideal way to bring a bit of the outdoors into the school while optimizing our square footage. Our LEED Gold certified expansion also includes a green roof, which covers 30% of our roof space. Like all of the spaces in our new building, the rooftop terrace was designed with flexibility in mind. 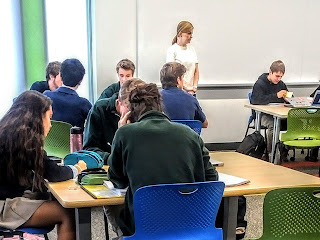 A variety of seating choices, including benches, picnic tables and cafe tables, give students options to match up with their use of the space. A sliding door connecting the terrace to our rooftop classroom turns the room into an indoor/outdoor space for science and Food and Culture classes. Teachers from other subjects have also used the ample seating on the patio to hold class outdoors. students looking for that perfect study spot. 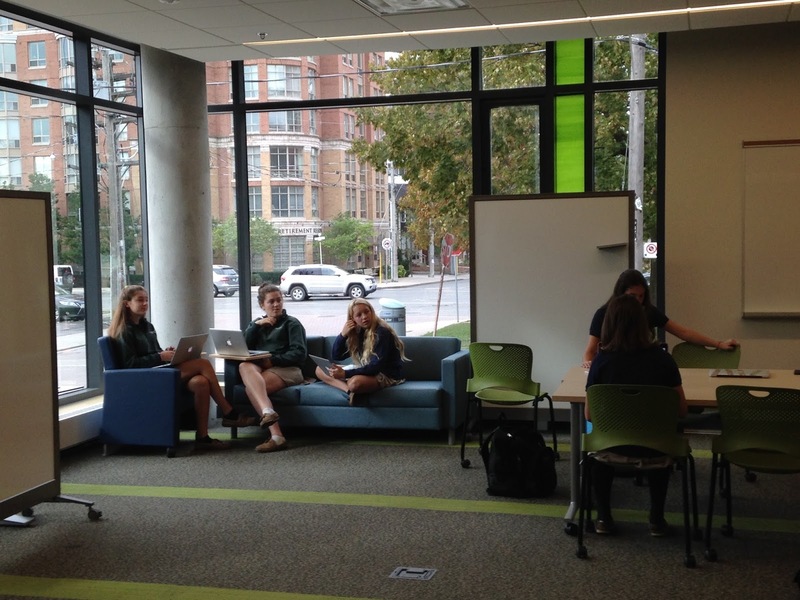 The value of our new study spaces is more apparent than ever as final evaluations approach. To a senior student in May, a spare is a precious gift: a whole 75 minutes that can be dedicated to completing homework and preparing for upcoming year-end evaluations. But to do that, students need spaces conducive to quiet study and collaborative work that are accessible throughout the day. A quick tour through the school at any time of day makes it clear that our students are making the most of the new spaces Greenwood has to offer. The Learning Commons is as busy as ever - the booths, tables and soft seating are frequently in use, and the three breakout rooms are popular group study areas. 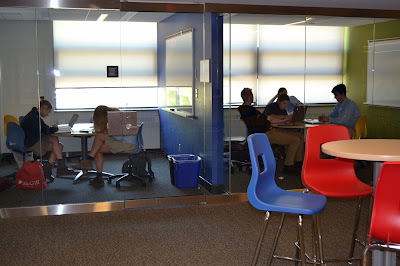 The second-floor breakout rooms adjacent to the Student Success Centre are constantly filled with students reading, working on their laptops or chatting quietly in groups. The study bars and cruiser tables placed throughout the school provide additional options for students looking for that perfect study spot. The booths in our Learning Commons are frequently in use. their laptops or chatting quietly in groups. Our new spaces give us tremendous flexibility when it comes to hosting big events. On the morning of April 6, over 60 students are working hard in our new gym - but they’re not wearing shorts and sneakers. Dressed in their best business attire and seated in small groups, they’re reading case studies, conducting SWOT analyses and putting together presentations. The working portion of the annual Grade 11-12 Business Case Competition - modelled after those students will experience in postsecondary business programs - has always been held in our gym. The large space accommodates all teams and ensures that they’re all getting the same instructions at the same time. Having additional space enabled all teams to present concurrently in order to get through their presentations by the end of the day. We had four rooms available for students to share their plans to help fitness giant Fitbit to maintain their market leadership position, each large enough to accommodate several teams and a judging panel. teams and a judging panel. As always, our experienced judges added an extra level of authenticity to the case competiton. The panel included several successful businesspeople (including two Greenwood parents) in fields ranging from banking to entrepreneurship to marketing. We also had three alumni with business and mathematics backgrounds bring their knowledge to the competition. Learning Community offers plenty of possibilities for both individual and group work. More and more research has shown that there is an important connection between where we learn and how we learn. Being in a spacious, well-lit room with a comfortable, flexible seating environment supports the development of oral communication skills, which are a vital component of learning a second language. With three breakout rooms, soft seating and lots of space to move around, our ground-floor Learning Community offers students plenty of possibilities for both individual and group work. French teachers Emily Borden and Heather Maxted recently used every corner of this Learning Community for a Grade 10 French lesson. Students had lots of room to spread out and practice for their oral interview. Working in pairs and small groups, students were practicing for an oral interview that would take place during the following period. With oral practice, the ability to clearly hear what your partner is saying is critical. The size of the room and variety of furnishings encouraged the groups to spread out, giving each the space they needed to practice effectively. development of oral communication skills. Greenwood’s new state-of-the-art science labs not only encourage inquiry and discovery, but also give our teachers more opportunities to customize our science program. What does a blocked approach look like in practice? Here’s how science teachers Evan Morrison, Julie Way, Anne Wellnhofer and Alan Kraguljac used it to help Grade 9 students investigate characteristic physical properties and evidence of chemical change over a series of three periods. students were ready to start the labs or should complete a teacher-led warm-up. The focus of these three periods was a multi-lab circuit. 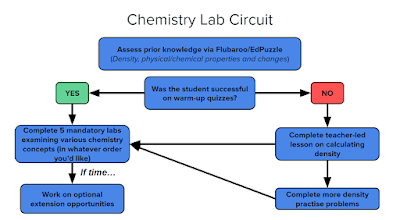 Everyone in the two Grade 9 Science sections finished the circuit having completed five mandatory labs, but how they got there was different for each student. Before students jumped into the labs, teachers assessed their prior knowledge using a Flubaroo quiz. 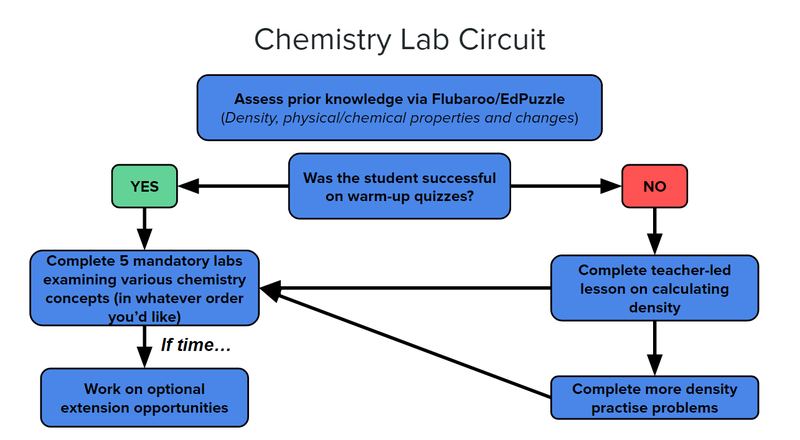 This quiz provided both students and teachers with instant feedback, indicating which students were ready to start the labs and which students should first complete a teacher-led warm-up activity. Students who completed the five mandatory labs with time to spare had the option to move on to extension opportunities building on the core concepts. Three teachers were on hand to help students throughout the multi-lab circuit. 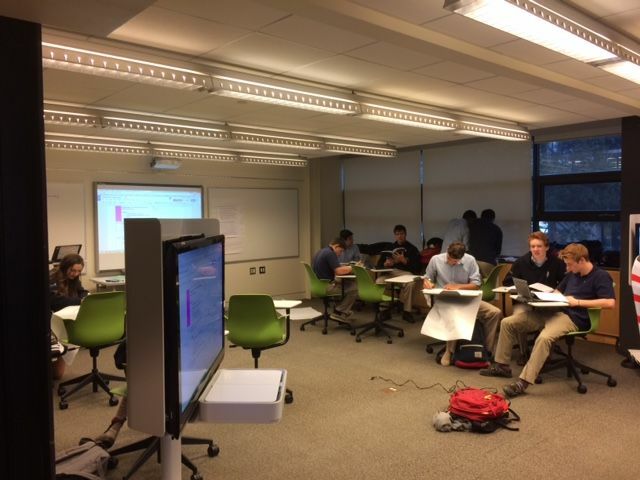 Seven lab stations were set up across two different rooms, with students free to move between the rooms as needed. One teacher was stationed in each of the two rooms, while a third floated between the spaces to check in with students and answer questions. Our new science labs provide space for several workstations. Students also had the option to watch online demos of some procedures. All students finished these three periods having completed the five mandatory labs, and took away a thorough understanding of the core concepts and detailed notes. Students who wished to build on their knowledge had the opportunity to do so with extension opportunities. “Giving the kids the flexibility to move at their own pace through the activities worked out really well,” says Julie Way. our Learning Communities to allow greater customization in Advanced Functions. A key piece of Greenwood’s customized approach to learning is giving students the power to choose how they learn. Some students prefer a teacher-directed lesson; for others, an online video lesson, which allows them to self-pace, is most effective. This knowledge inspired the design of Greenwood’s new Learning Communities - flexible rooms that easily reconfigure to support many different types of instruction. Those listening to Megan’s lesson remained at the front of the room. Students who wanted to complete the video lesson in a small group chose one of the breakout rooms, where the sound wouldn’t interrupt the teacher-led lesson. Students who wanted to complete the video lesson individually headed to a small nook by the window, where they used earphones. Both teachers allowed these options in previous years, but co-teaching in a larger space with flexible furnishings offers Megan and Kelly even more opportunities to customize lessons. is designed and furnished to facilitate fluid transitions between types of teaching. Two key initiatives in our new strategic plan involve establishing a Centre for Teaching and Learning to help teachers advance their use of customized learning and ensuring that we optimize our new spaces to build learning and community. 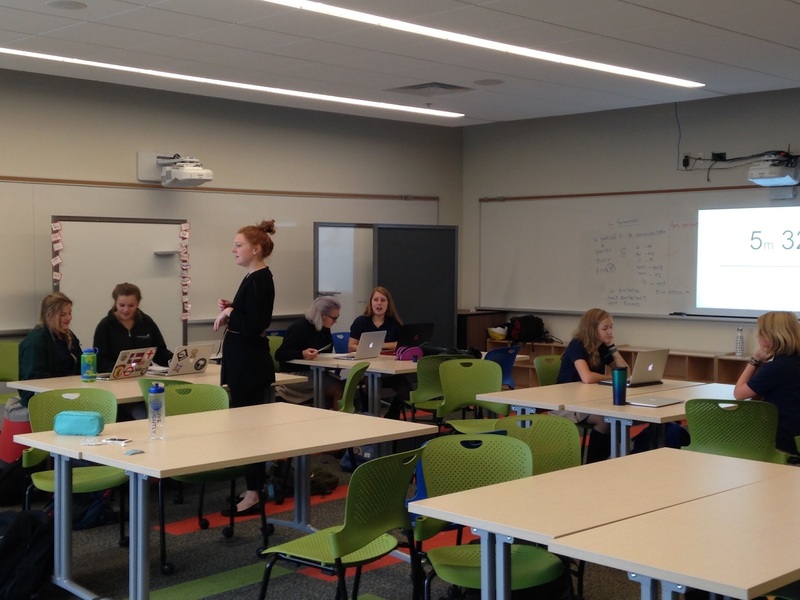 Throughout this year’s edition of our school blog, we will share examples from teachers of how they are working with students in the new spaces on these initiatives. We will also examine how teachers collaborate with one another to enhance their professional growth. One key principle we want to illustrate with our new classroom spaces is how they promote individual, peer-to-peer and whole group learning. Physical settings make a significant impact on student engagement. Greenwood's spaces are designed and furnished to facilitate fluid transitions between types of teaching and ultimately, should enable students to take greater control of their learning. These spaces also feature technology that supports vertical and horizontal surfaces that can be used for projection, display and interactive learning. Besides classroom learning, our new spaces are also designed to enhance the social, physical and creative culture within the school, all of which contribute to the development of character. 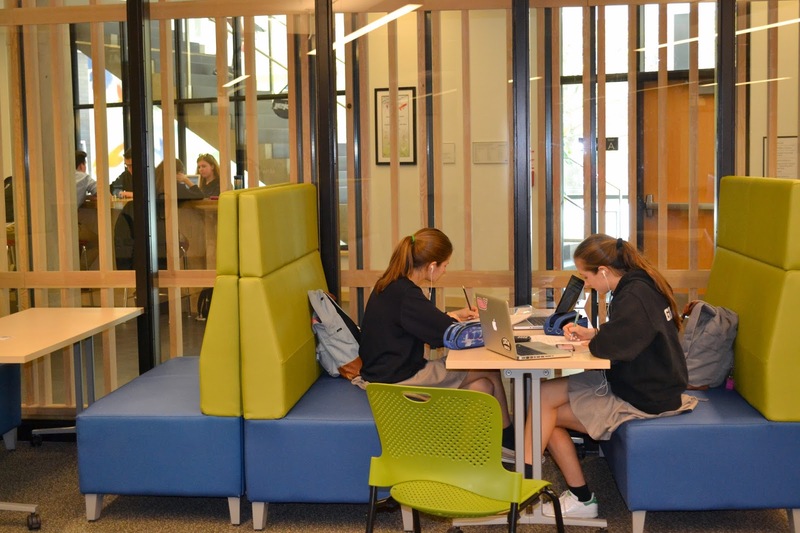 So, we want to show you how students are using the Learning Commons, the second gym and the new arts spaces. Ultimately, we hope that students are engaged and enjoying life here at Greenwood. With the new French curriculum, there is a significant emphasis on the authentic use of oral communication. 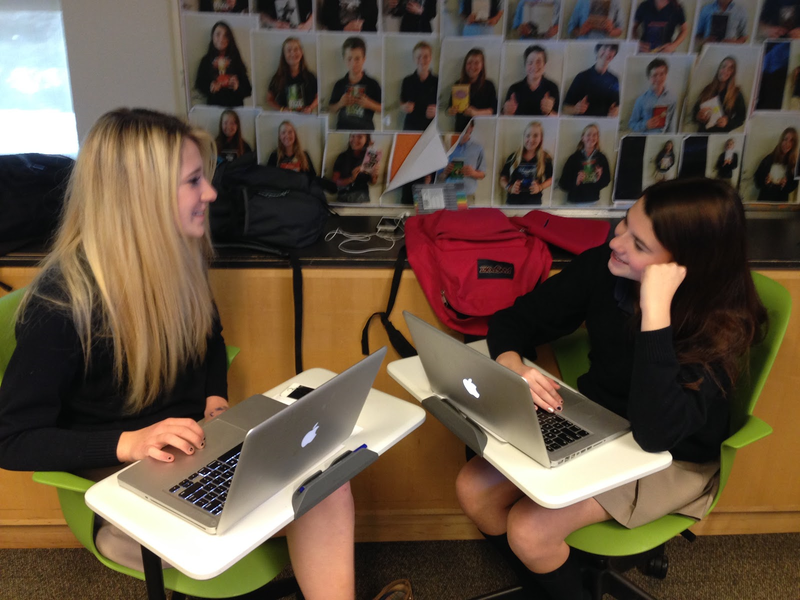 With the two teachers in the flex classroom, we have been able to provide considerably more opportunity for teacher observed peer-to-peer conversation and student-teacher conversation. The flexible space allows for a variety of groupings. A strategy we have found most effective is to have ‘home groups’ where students start (and often end) each class. These home groups are given a name according the the theme of the unit in order to build group identity (for example, this unit each group is named after a French invention) so we can boost opportunities for collaboration and meaningful teamwork in the target language. Often a warm-up will include questions that the students need to discuss and explore aloud with their home group. As the class progresses, students can move easily between individual activities, pair-groupings, or small teacher-led groups depending on need and interest. Because there are two teachers in the room, we have been able to significantly increase the amount of feedback students receive on their oral communication. We will frequently have students work with a partner to practice a spontaneous dialogue (for example, how to navigate an incorrect order at Starbucks). When students feel they have met the learning goal and are ready, they can present the dialogue to a teacher, receiving instant specific feedback about their task and discuss ‘next steps’ to improve for the assessment of learning. Since there is always at least one teacher available for individual and small-group feedback, the students learn and grow notably from one class to the next. The Grade 12 English and Grade 12 AP English classes have now reached a point in the year in which their learning must be divided according to their own learning needs. Both classes are focused on the skill of critical thinking yet are moving through classroom activities differently because of separate course goals. Ultimately, we have the same goal which is to prepare the students to be critical thinkers and clear communicators as they move on into the world beyond Greenwood. 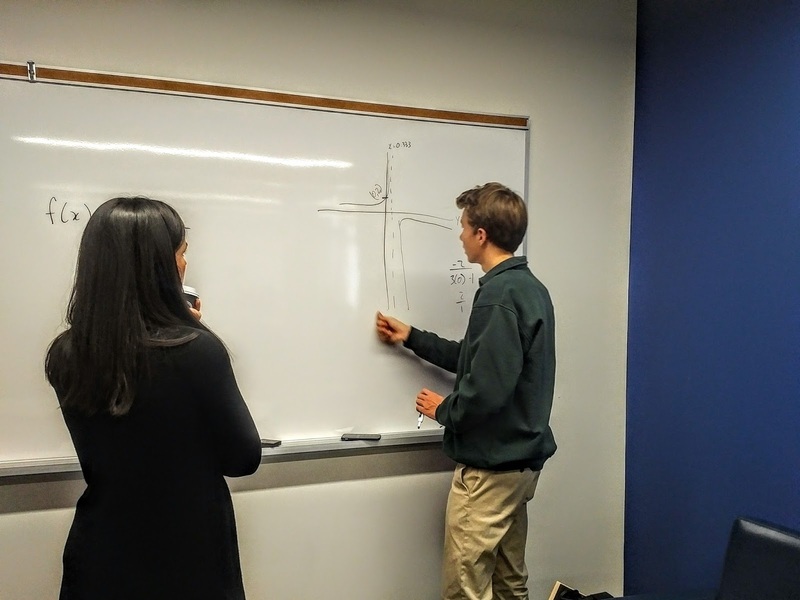 The AP course necessitates preparation for the standardized exam and these students are well engaged in in-depth analysis of a breadth of poetry spanning the centuries. Students in the Grade 12 course are currently working on an integrated research paper connecting to their learning in another course. Certain students have also chosen to pursue research topics according to their own interests or subjects of focus for next year. The unit includes a trip to the Toronto Reference Library for an orientation tour as well as a workshop on the research process to help prepare students for future research projects in various institutes of higher learning. As teachers, we realized that there are times when it is necessary to divide according to course priorities. We have found the flexible learning space allows us to do this. We use a moveable wall for visible separation and the Node Chairs provide easy room arrangements. Within the classroom, you will find a very calm atmosphere with short lessons and plenty of quiet independent work time. Having two teachers allows us plenty of possible one-on-one conference time and facilitates the independent personalized atmosphere that is desired. 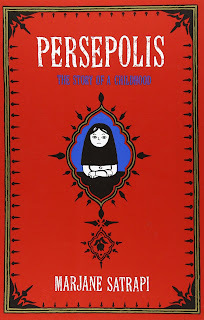 a graphic novel like Persepolis. As the Grade 10s finish up the second unit, L’enfance et l’adolescence (Childhood and Adolescence), we look at how personalization continues to be offered in the learn lab. Compared and contrasted how youth in different countries express themselves informally, with their friends and on social media. Reading an authentic graphic novel is a challenging task, so having two teachers in the learn lab classroom allows us to offer students different approaches to understanding the novel. Some students may prefer a more structured reading environment: where they are coached on specific strategies and discuss with the teacher as they read. Other students may work independently: with a set of guiding questions and a teacher available if they encounter a stumbling block. Still others prefer to read aloud to a peer and create their own summaries and notes. The flexible nature of the learn lab allows students to move between these methods easily and often (for example, they may prefer teacher guidance on a particularly difficult passage but prefer to read independently on another). Metacognition (thinking about thinking) remains a focus in this course. Students continue to set specific goals and spend time considering their progress towards each of the overall expectations for the course. Students can explain in detail what needs to be done in order for them to improve in each strand (reading, writing, listening, speaking). Students use Google forms to give immediate feedback on their progress, allowing us to focus on areas of particular challenge for each student. 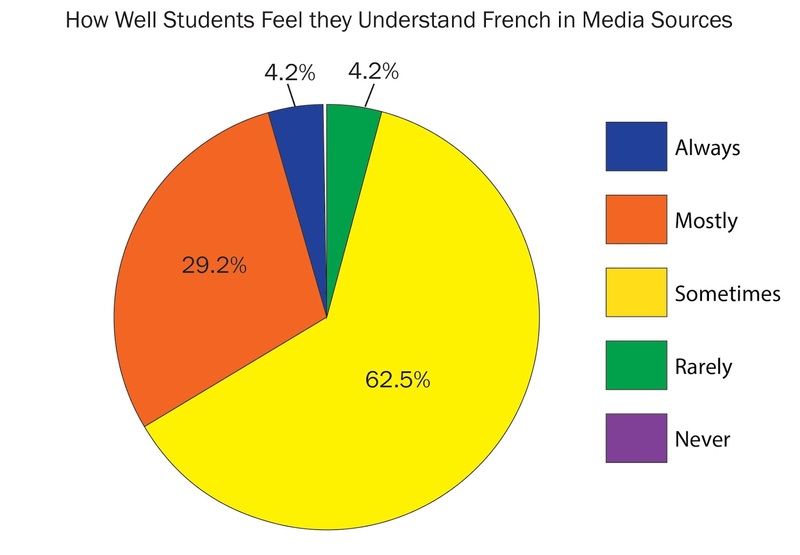 For example, many students identified that although they could listen and understand conversation effectively, they were less confident when hearing new accents in a variety of French media. Based on this feedback, we could immediately incorporate more authentic media into the upcoming lessons to help the students progress toward their individual goals. The use of authentic media was also emphasized in the French-teaching workshop attended by both teachers in the previous term. Here we learned to further integrate the Common European Framework of Reference into our day-to-day teaching. This internationally recognized framework is used to objectively place the students on a language continuum (from A1 - beginner, to C2 - mastery) and helps to identify concrete pathways by which language learners can improve. It’s post-Winter Break for students in Grade 12 English, and that means it’s time to talk about Hamlet. In both the university preparation (4U) and Advanced Placement (AP) streams, students are examining the language of Shakespeare’s most popular play. The focus of this unit is to think about the play’s big questions--who can we trust, what is justice, are we defined by our actions or by our intentions--while also working on close reading skills to more fully appreciate the intricacy of the language. 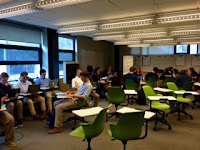 The combined ENG4U/ENG4UO course in our flex classroom, room 207, takes advantage of flexible groups and space with class discussions that allow for a range of opinions matching the number of students in the room. When examining questions of morality or conscience, like whether or not Claudius is a good king (not person), diversity of thought allows students to be challenged and confronted by other points of view. Recapping an act of the play via Twitter summary also sparks an unspoken creativity contest to see who is most masterful in their use of hashtags. The flexible space also allows for differentiation in terms of level of challenge when performing a close text analysis on passages of the play. After a common review of literary devices and lesson on how to notice aspects of language in a text, the class splits into groups to learn how to effectively communicate about the passage. The AP students (as well as any students who opt in from the 4U class) examine a more intricate way to organize an essay, while the rest of the class gets to work applying a more traditional method to the complex ideas and language in front of them. In either option, the depth of thought expectation is the same, so all students must strive for the complexity and insight befitting Shakespeare’s most notorious thinker. 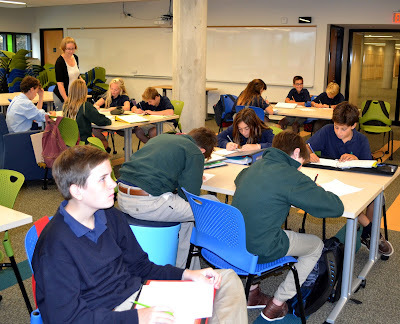 Room 207 is a flexible space where students and teachers learn in tandem with one another. A flexible space demands a flexible approach. This post focuses on the value of having a flexible physical space in terms of the diversity it creates for instruction. In the classroom, abstract learning goals become concrete physical arrangements. In advance of the class, we determine groupings and seating arrangements so that students may choose, or be placed, in a grouping based on their strengths, their interests, or the level of support they need to learn and interact with the material for the day. We also have the benefit of being able to easily rearrange students as the lesson progresses. When students work ahead, or need to meet with a teacher one-on-one, their needs can be met right away. The teacher-student conferences have been especially supportive and informative. We are able to meet with students one-on-one for anything from conversation assessments of learning, to relaxed check-ins. Getting to know the students in this way informs us about how to make our groupings and how to adapt our teaching to meet the needs of each student. This space allows the more abstract elements of differentiated instruction to be made tangible. Students make choices and have to partner their choices with a physical action. Something as simple as moving to the corner of the room that reflects their favourite style of instruction, their need for support in the moment, or their choice of text to read, allows students to become partners in designing their course. While reading Into the Wild in our survival unit, students were able to choose to actively read the book alone in one corner of the room, read the book with a partner in another corner, read the book in a 'popcorn' style in a larger group, or have the book read to them by one of us teachers aloud. Even as the activity was taking place, students were able to move to the corner that they realized suited them best for the day. The fact that Grade 9 students are aware of their learning style to this degree is excellent. Similar activities have been done with instruction and support. It has been interesting to observe their level of engagement and self-awareness as the year has progressed. 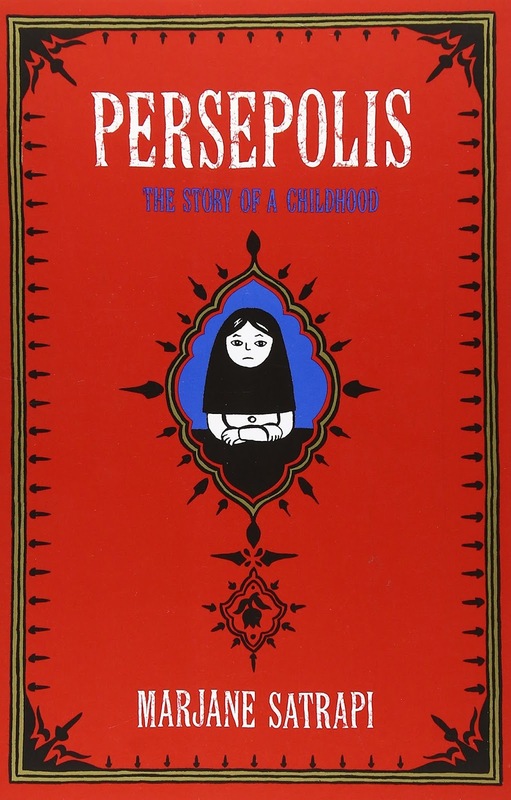 In our current unit about family and friends, students will be in literature circle groups based on one of four novels that they chose based on interest and stretch. We're looking forward to applying what we have learned about the space and the students to these discussions. Two years ago, I posted “Reinventing the High School Experience,” which reflected upon one educator’s claim about the need for high schools to “revolutionize” themselves. As the postings on this blog over the past two years demonstrate, Greenwood has made great strides in this direction. 15 high school courses, ranging from Grade 9 to 12, are now delivered using a blended learning model. Using this approach has allowed students to learn at their own pace and freed up class time for more individualized and small group learning. Non-blended courses continue to leverage new types of learning technology, such as Oxford Next and The Academic Zone, which enable students to customize their learning. 6 Grade 7-10 subjects are now scheduled in a block format, which enables flexible grouping based on readiness or interest within a grade cohort. Our Grade 7-8 Arts program has introduced a major/minor approach where students can specialize in one or two of our four arts electives. 75% of our teachers now use Hapara on a regular basis. Use of this Google tool allows teachers an overall snapshot of individual student learning. We have re-modeled two classrooms to create one flexible learning space, equipped with state-of-the art technology and furniture. Ann Marie Kee, the Executive Director of the Canadian Association of Independent Schools, recently observed that independent schools are often reluctant innovators. I am proud to be leading a team of educators that have the expertise and courage to think differently about high school and how it can be improved to better meet the needs of our students. Providing students with choice not only allows greater personalization in the classroom, but gets students really excited about learning. English and Student Success Centre teacher Kathryn Connelly details how giving Grade 7 students three book options for a recent novel study made a big impact. At Greenwood, all sections of Grade 7 English meet at the same time in adjacent rooms. We also see this class every day. This method of scheduling in Grade 7 English allows for a great deal of flexibility, which benefits both students and teachers. Our most recent novel study unit gave us the opportunity to work in flexible groupings based on the individual learner’s interests and needs. Before beginning the unit, each teacher gave a brief introduction of the novels, all by Canadian author Eric Walters: Safe as Houses; Wave; and Shaken. These novels varied in length and difficulty. Students then selected one of the three novels by filling in a preference sheet. Based on both student interest and literacy skills, which were assessed in previous units, the students were grouped. The English classes were then mixed and regrouped based on which novel the students chose to study. Each teacher took a different novel group. The individual strengths and needs of each particular group of students determined how the class was taught. Where one class took more time to read and analyze the novel through basic story devices, another class worked on examining and analyzing the novel through real-life examples. These groupings allowed each student to be stretched to reach their own individual potential, as well as develop a genuine and inquisitive interest about the topic. As a result, all three classes had great success! At the end of the unit, student reflections highlighted how happy they were to not only have had the opportunity to explore a novel they were interested in, but happy to have had lessons, activities and assignments that were tailored to meet the strengths and needs of the wide variety of learners in their grade. Eric Walters visited Greenwood during this novel study unit to discuss his work with our Grade 7 and 8 students. Read about his visit on our website. Personalized learning isn't just about the content of the lesson - it's also about the space in which students learn. 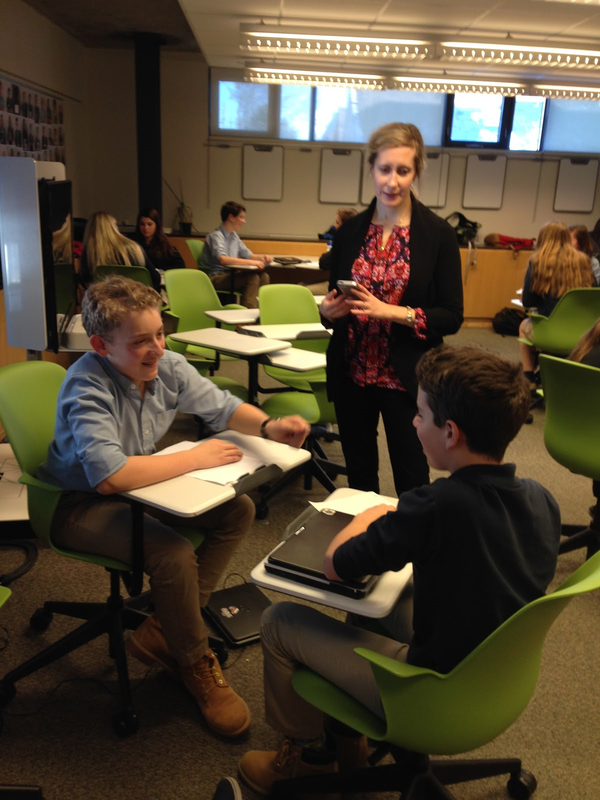 Geography teacher Christine Joannou discusses how Greenwood's new flexible classroom allows students to choose the learning method that works best for them. If students choose the teacher-led option, one of the teachers will take them through the lesson, explaining concepts, asking guiding questions and pacing the lesson based on student needs. 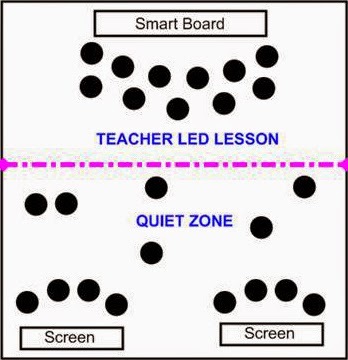 Students also have the option of learning in the "quiet zone". 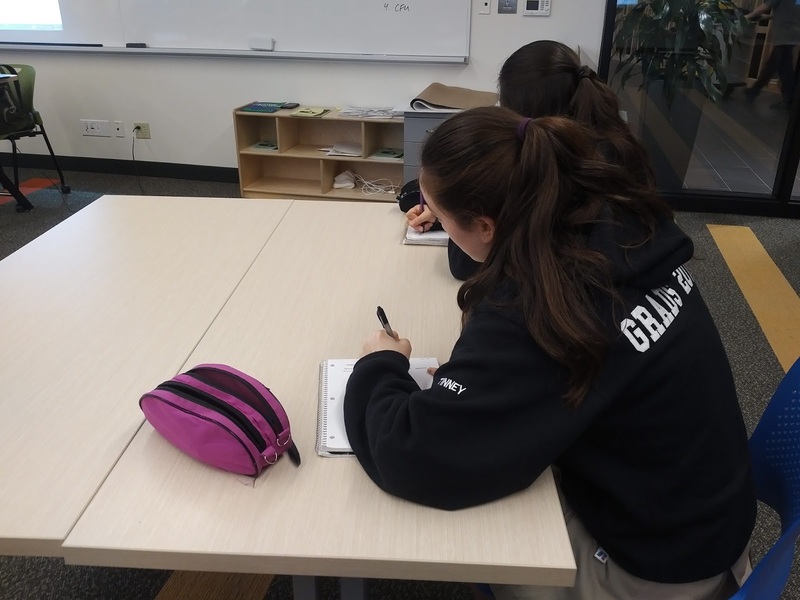 In the quiet zone, students work independently to go through the lesson on their own; a teacher is always available for questions, should students need clarification. Learners work through the lesson at their own pace, and dive deeper into certain topics if they finish the lesson early. The classroom setup also allows students to work in small groups around small display screens. They can still work at their own pace, but have the support of either their peers or the teacher if needed. This option fosters student collaboration throughout the learning process. 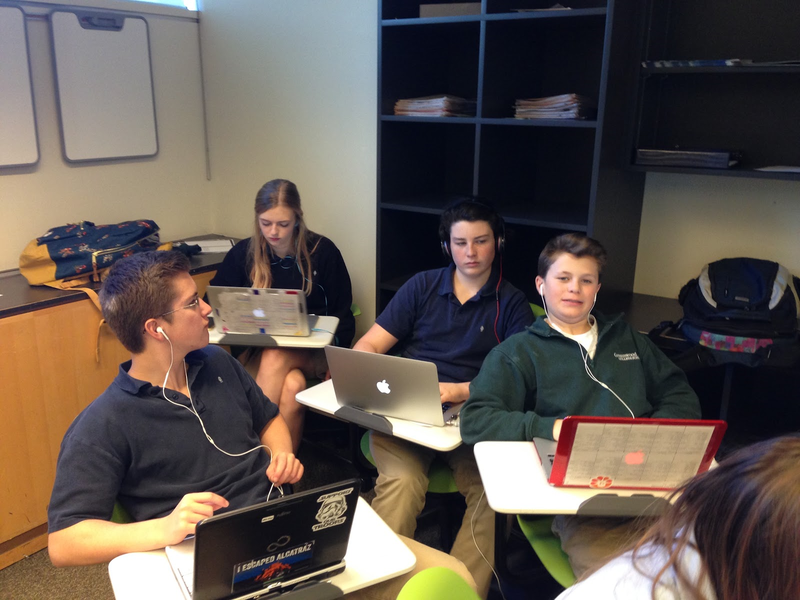 The flexible classroom setup has allowed us to cater to each student’s needs. Students who need more time to understand a concept are given that opportunity, while students who want to complete the lesson and move on to enrichment activities have this opportunity as well. Students have enjoyed this lesson approach, as many find the pace of a more traditional lesson does not cater to their needs. They enjoy the flexibility of this 21st-century classroom set up, which uses two teachers and blended learning tools to enable them to choose the most effective learning method for them. This week, English teacher Jennifer Walcott explains how she encourages students to customize the what and where of our Grade 12 Writer's Craft course to suit their needs and interests. The Grade 12 Writer’s Craft course is an English elective, usually chosen by students who enjoy creative writing. As the course is process driven rather than content driven, students have many opportunities to make choices based on their interests and to develop a work plan that suits their schedules. The recent non-fiction unit allowed students the option of what forms of writing they wished to learn, but also gave them the option of where they would complete their assignments. All of the course steps and requirements were outlined to students in class on the first day of the four-week unit. The readings, quizzes, tasks, and rubrics were all presented with a weekly due date for each of the four tasks for the unit. Students then had several options they could follow. They had to select two forms of non-fiction writing from a menu that included: travel, interviews, opinion, feature, sports, reviews, and obituaries. Read expert guidelines for success criteria and complete two reading quizzes. Find six real-world samples of the forms of writing. I offered several suggestions of sources plus samples of magazines for these, but students had to secure their own. Write an analysis of how one of the samples met the criteria they had identified. Write two original pieces of their own and annotate them to show where they were meeting the criteria. Students were encouraged to create one of their pieces for the school newspaper. Students were also provided a package of exercises to improve their diction, syntax, and punctuation. These were warm up activities that they could do on their own. 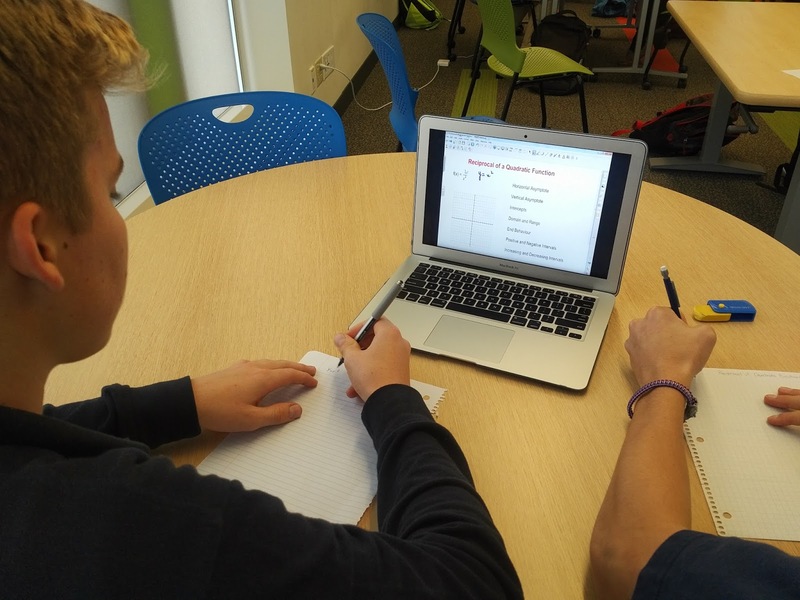 Two peer editing sessions were built into the schedule as students have repeatedly said they prefer face-to-face peer editing rather than online editing. Each student was invited to a conference with me and with a weekly due date for tasks, I was able to see how students were progressing through the tasks and to call in any student who needed additional support for another conference. Students were also able to request a conference during class time if they wished. I was always available during class time, and several students chose to work in the room where it was quieter and they could be more focussed. However, some students preferred to work on Writer’s Craft tasks late at night and used our class time to complete work for other classes as needed. Writing is a fairly solitary task. Once you know what you are trying to do, it’s a matter of drafting and revising. This personalized and blended approach allowed students to work at their own pace - a few students completed tasks ahead of time - and when and where they found most conducive to the tasks. The challenge was time management. Those who planned were successful, those who did not, were less so as they lost revision time. However, with weekly due dates, I was able to contact those who needed help in managing time and the frequent check ins meant no one fell behind in submitting work. At the start of the unit, students were offered a challenge to work as a group to create a magazine or newspaper and build their writing around a specific target audience. Three groups selected this option, but only one actually completed it. The others found the challenge of working together too much and gradually opted to work alone. Interestingly, the group that stayed together to produce a magazine of their articles was made up of the students with the most mature time management and organizational skills. My challenge for the future is how to teach those skills beforehand so more students can have this real world experience. When students come into the classroom with varying levels of prior knowledge, it can be tough to keep everyone engaged. Science teacher Vanessa Floras explains how she customizes her Grade 8 science class to ensure that all students are invested in their learning. The Grade 8 science curriculum includes a number of broad topics. As a result, students have varying levels of prior knowledge when it comes time to approach new concepts. During our 'Cells' unit, we focus on the concepts of osmosis and diffusion. After some short introductory direct instruction, students work through the rest of the lesson at their own pace. Students select the degree of difficulty appropriate to their level of understanding and complete the problems based on their ability at the time. Students end with an exit card that allows them to synthesize the core concepts from the lesson and demonstrate their learning. In the second class, students are put into groups based on their understanding from the previous lesson, in combination with the results from their exit card. In these groups, they develop a lab procedure that investigates the concept of diffusion. Students select from a list of options, or can submit a proposal for a concept of their own design. Over the course of two classes, students design, execute and write their labs. This offers them ownership over their learning while performing an experiment that will solidify their understanding of core concepts. Students have responded well to this flexible style of learning. Many have expressed that they were more invested in the results of their lab, gaining a deeper understanding of the theory as a result. There are many ways to meet the needs of individual students or groups of students within our own classrooms. If we schedule more than one section of a course at the same time, then multiple teachers are available to work together to meet the needs of the students in their classes. Teachers can then work together on the initiative of meeting students’ needs rather than working alone. one group gets concept reinforcement and the other group gets some extension work. This is not streaming. The students still have a mixed-level classroom and an assigned teacher who they are with most often, but the students also have the opportunity to work with groups of students whose needs are similar. On the days when groups are created between the classrooms, the teachers can focus in on what the students in their group need rather than having to do multiple tasks all within their own classroom. We have created a timetable for the 2013-2014 school year in which a few courses have more than one section running at the same time. The teachers of these courses will modify the groups in their classrooms for various reasons. Sometimes they will use assessment results to regroup for content readiness, similar to the Grade 7 mathematics class. Other times, they will shuffle students between classrooms based on interest. In English, students could choose different novels to study and then meet with their novel group for discussions. Students in this novel group could be a combination of students from 2-3 different classes within the same course. Alternatively, teachers may give students the choice of how to work through material in a series of lessons: one group may use technology-rich resources, another group would have a teacher-directed lesson and a third group may work through a series of activities. Scheduling 2-3 classes of a course at the same time means that these three paths could run in different rooms, each with a different teacher. Students could also be grouped by their learning style for some lessons. Students in these courses will have a core teacher to whom they are assigned. They will also have the opportunity to interact with other teachers of this course and other students beyond their usual classmates. Students will get multiple perspectives. Teachers using this approach will work together to plan their classes, assessments and common evaluations. They will get to know the needs and interests of all of the students in the course, not just those in their own room. Teachers and students will be part of a bigger community that extends beyond their own classroom. I had the opportunity recently to attend a presentation by representatives from Steelcase that focused on how school design is changing to make learning more interactive and student-centered. Over the past few years, Steelcase has researched how space and furniture within schools can be repurposed to better serve the needs of 21st century learning. Their research indicates that learning spaces could be improved if they were made more flexible and allowed for greater student movement and interaction. By making all furniture movable, teachers can easily reconfigure the room to suit the purpose of the lesson. The presenter shared many examples of colleges and universities that have incorporated these principles into their new learning spaces. A key change in these classrooms is ensuring the teacher is no longer confined to the front of the room. By making all furniture movable, teachers can easily reconfigure the room to suit the purpose of the lesson. This type of movement might happen two or three times within a single class. Another key feature of the adaptable classroom is making use of all four walls as surfaces for learning. This approach also ensures teachers don’t simply lecture from the front of the room. Rather than listening passively, students can instead work actively in small groups. Rather than having a single Smartboard or whiteboard at the front of the room, adaptable rooms have interactive surfaces on three points of the room. This allows small groups to have access to mobile technology, which is useful for sharing visual information and solving problems as a group rather than solely relying on teacher direction. Adaptive and flexible learning spaces are fundamental to Greenwood’s delivery of personalized learning. 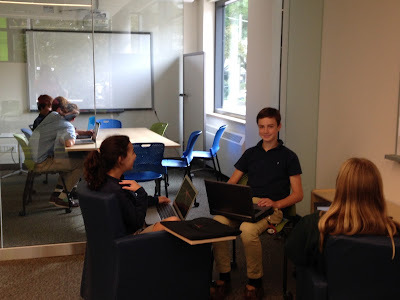 Increasingly, students will need spaces to work individually or in small groups. Presently our classrooms are configured to support large group learning. Not surprisingly, the learning spaces designed for our planned expansion will take full advantage of the ongoing research by Steelcase and other organizations about what type of learning spaces will best meet the needs of our students.